Based on the proven Standard Docking Iron design the Te Pari Patesco Docking Iron treats the end of the tail in such a way the upper surface of the end of the tail heals with bare skin rather than wool. The bare area on the top of the end of the tail is of sufficient size that the wool will not grow long enough to fall over the end of the docked tail allowing dags to form. The tynes on the patented rotating anvil system of the Patesco Docking Iron, grab and stretch the wool out during the docking process. No wool overhang for a cleaner dock. The Te Pari scissor action docking iron enables lambs to be docked virtually anywhere, without the need for a baseboard under the tail. Surgical docking is less stressful to lambs and searing leaves a clean, sealed wound that reduces lamb losses due to infection and fly strike. The High Wind model features the large jet and burner system that makes it virtually wind proof with a copper alloy searing head for swift heat up, heat retention and longer life. The XL Castrator uses a heavy-duty latex ring system to castrate, opening to 90mm x 70mm x 70mm in the shape of a triangle. The ring is 19mm in outside diameter, 10mm in width and covered in antiseptic powder. Its twin lever action means the ring stays held open with only a light grip. Once the ring has been placed over the scrotum the operator releases the castrator’s lever to remove it. The castrator handle does not lock open making the release easy when the ring has been located. The Tri-Band Calf Castrator is a proven and popular castration method for calves up to 2-4 months or approx 150kg. The castrator has a large opening size of 55mm x 55mm x 60mm in a triangle shape. It allows superior single-handed control; when the handle is pulled back, it over centres and will stay open by itself, making placement of the ring easier. Also the ‘golden’ coloured Tri-band rings have as square profile which stops the ring rolling off the prongs of the castrator. 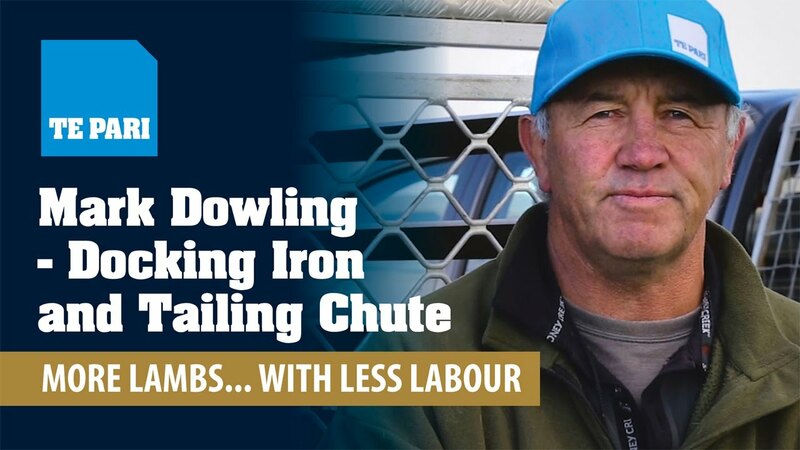 Te Pari Tailing Chutes, fast and easy. The Te Pari Tailing Chute is used for ear-marking, vaccinating, castration, drenching, and scabine vaccination. All of this can be done with ease from either side of the unit. There is enough room on each side for several people to work and procedures can be done at either end. The standard Tailing Chute is 1.6 metres long, but you can add a tipper which increases the length to 1.9 metres.